CHEVALIER'S GINGER BRANDY, CALIFORNIA. 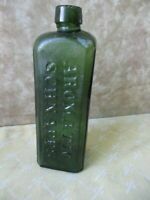 ANTIQUE APPLIED GLOP TOP WHISKEY BOTTLE. cmcollectiblesandantiques has no other items for sale. ANTIQUE HAND BLOWN GLASS WHISKEY BOTTLE JUG WITH SHARP PONTIL LOTS OF BUBBLES !! Country/Region of Manufacture: United States Volume: 2 oz.